Four Points by Sheraton Bali is a hotel in Kuta, located at Jalan Benesari, Banjar Pangabetan, Kuta, Bali. This hotel is in a very narrow street, the road to the hotel is just quite passable by one car. But in the way that there is a luxury hotel. 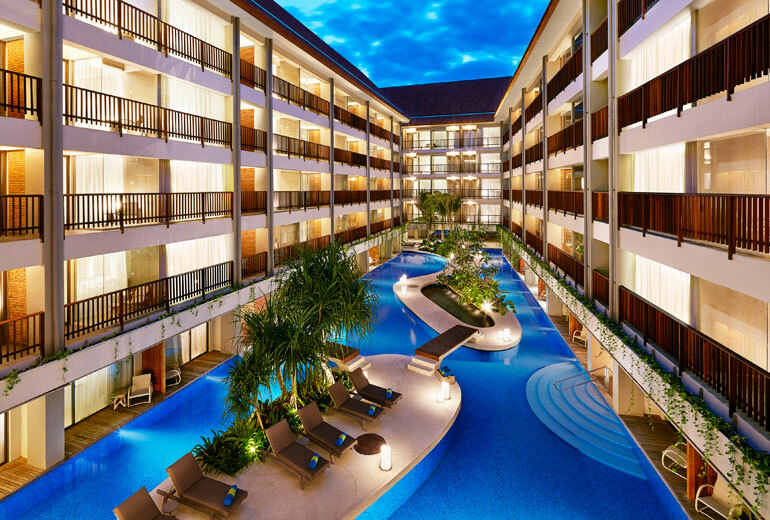 Four Points by Sheraton Bali is located in Kuta, Bali. From Gusti Ngurah Rai Airport can be reached in about 15 minutes towards the hotel. Heading into the area of ​​the hotel, the car must pass through the narrow alleys. As they passed the car in the opposite direction, then one of the cars had to yield in order to pass through the alley towards the hotel. The hotel has been providing shuttle services from Ngurah Rai Airport to the hotel and vice versa, free of charge. The hotel's location is quite strategic. Just 10 minutes walk to the beach of Kuta and Legian near the well. Four Points by Sheraton Bali stands, with masts towering buildings. The most flashy building stands among other buildings. The hotel lobby with a ceiling filled with beautiful lanterns. Impression of Balinese luxury but still very pronounced. From the lobby located on the second floor, looking lagoon-style pool in the first floor. Shows the bottom of the pool water is blue, as deep as 1.2 meters. In this lagoon there is also a Jacuzzi with a depth of 90 centimeters. Besides lagoon, the resort features a swimming pool for kids as deep as 60 centimeters, also pool at the roof top. On the roof top, there is a bar and a pool which is pretty cool for swimming, sun bathing. Sun bathing are more satisfied because it is directly exposed to sunlight. Four Points by Sheraton Bali provides 185 rooms that are divided into several categories. Room deluxe lagoon room access is directly connected to the pool. So no need to bother to walk to the pool, simply open the door of the room, the swimming pool or Jacuzzi can be enjoyed. There are 22 rooms in this category. Everything is on one floor. Other rooms are deluxe lagoon view. For families with small children, suitable in tipedeluxe pool view. The rooms of this category there are only five. Therefore, the bedroom door directly connected with children's pool. In addition, there are also family suits and comfort suit. With an area of ​​55 square meters, family suits suitable for families. There are two bathrooms, one bath, one shower. There is a sofa bed, which can be utilized. Staying at the Four Points still feels like staying in a five star hotel. Beds Starwood Hotel Group standard that is KingKoil. Additionally, rooms include 40-inch televisions with cable channels, minibar, and 24-hour in-room dining. The existence of a balcony in each room add to the comfort of staying at this hotel. The hotel room rates start from US $ 85.